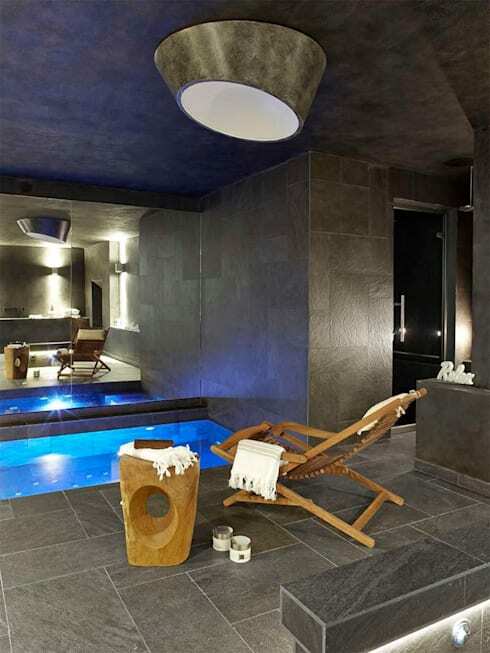 Rich natural wood and stone in different shades are the main components of this sprawling mountain home by the interior architects at Deu I Deu. The residence brilliantly accommodates the slope of the land by featuring different functional areas at different levels. 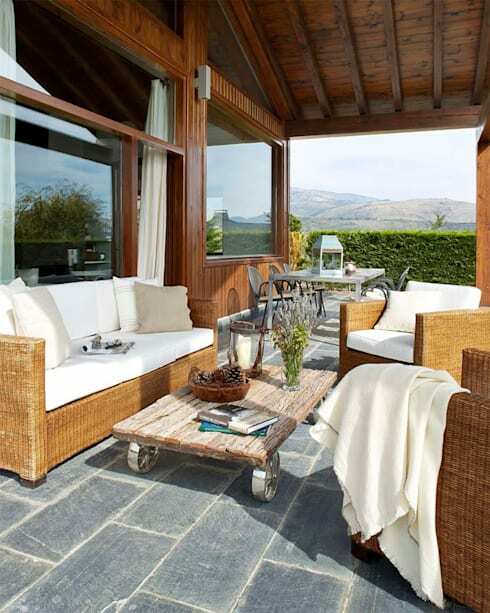 A large shaded terrace offers stunning natural views, while the interiors wow with rustic yet elegant furnishing. Salvaged wood has been used in many furniture pieces to create a vintage style ambience, while the colour palette is soothing and neutral. Set on a hillside, the large house welcomes with its warm wooden walls and grey slate roofs. Large glass windows allow sunlight to flood the interiors, while the lush grassy surroundings make this the perfect vacation home. The views from all sides of this property are breathtaking. 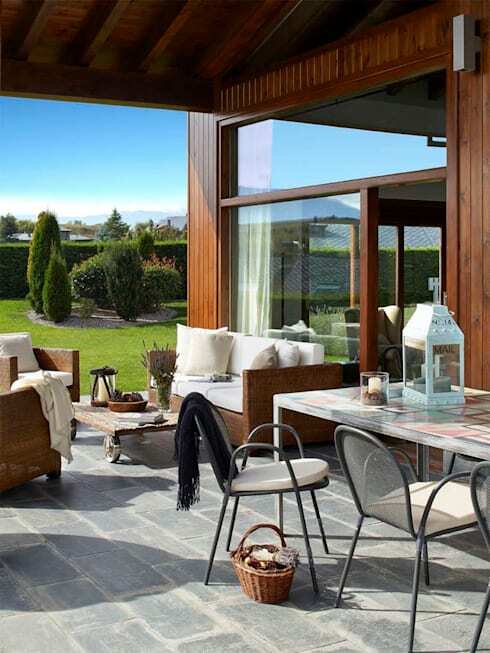 A wooden ceiling, neat grey stone tiles on the floor and cozy rattan furniture are the selling points of this spacious and sunny terrace. Note how the coffee table has been crafted from a wooden slab and four steel wheels. Massive glass windows on practically all sides flood the living space with sunlight and a cheerful vibe, besides offering lovely views of nature. Plush white sofas and elegant armchairs promise cosy seating, while pretty pebbles line the floor for an organic touch. 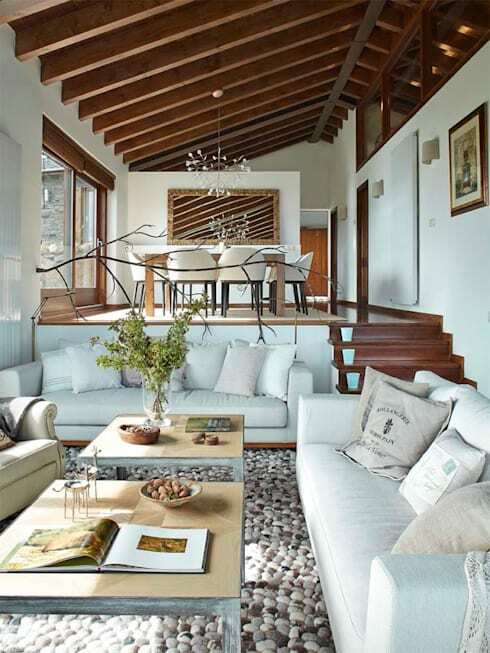 A short flight of wooden steps takes you to the dining area which is on a higher level than the living. Heavy wooden beams line the ceiling above the table, and a branch-like artistic partition visually separates the living from dining. 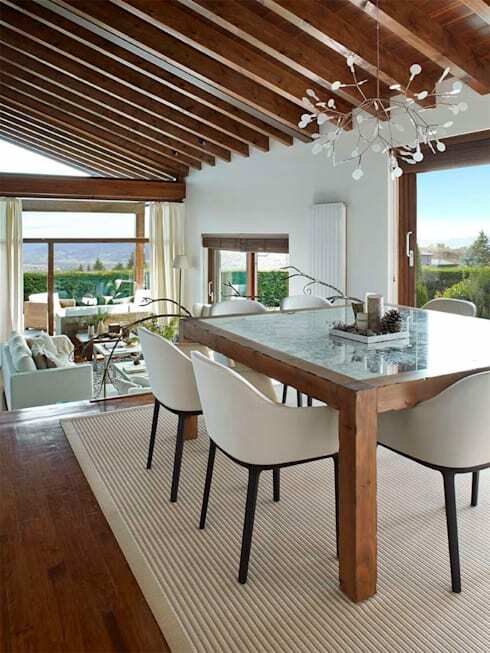 Trendy white chairs surround a sleek wooden table to make mealtimes pleasurable and warm in this house. 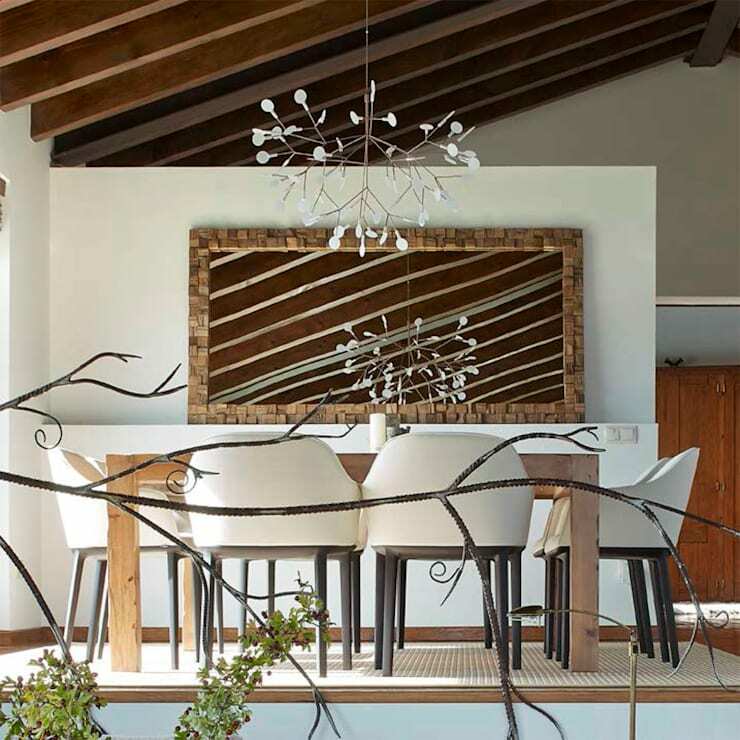 A large mirror framed with small stones enhances the rustic ambiance, and complements the unique chandelier. 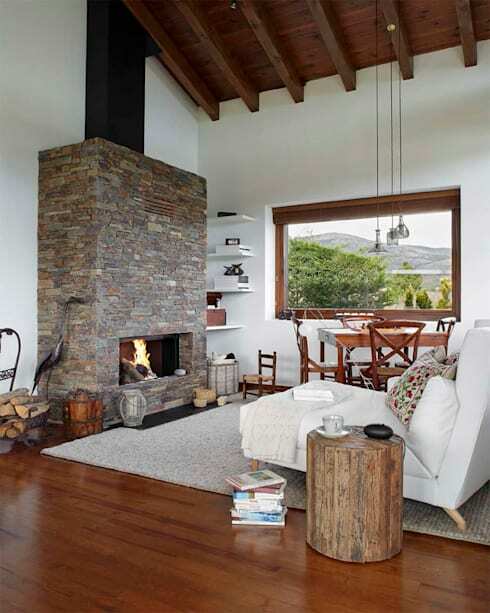 The stone-clad fireplace is the showstopper in this warm and rustic living space. Wood contrasts the white walls beautifully, while a stylish lounger helps you relax, unwind and admire nature. Casual dining furniture near the window makes for happy teatimes. 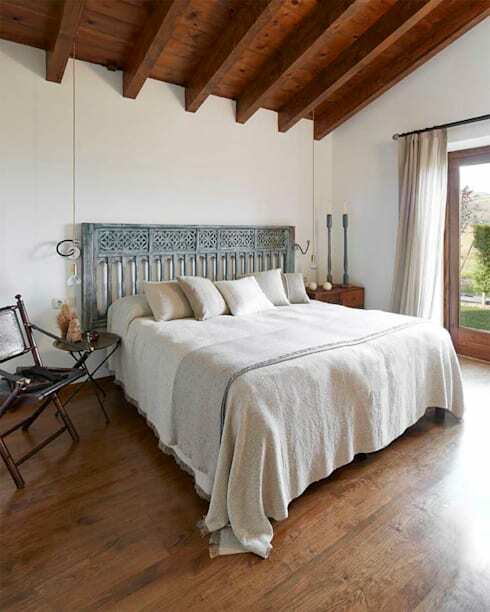 White walls and wooden floor and ceiling make this large bedroom warm and welcoming. The large bed is adorned with plush linen and features a charming distressed wood headboard. Lights have been suspended on golden cables from the ceiling to cater to bedtime reading. 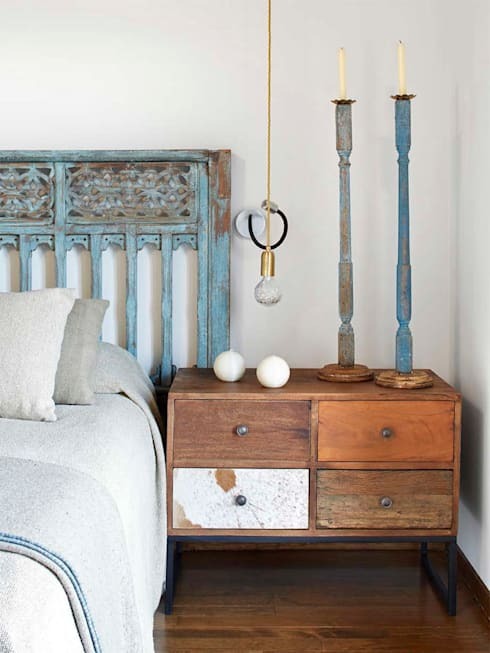 We especially love the neat bedside table made of salvaged wood and the unique candleholders. Grey stone surroundings lend a very elegant and unique edge to the refreshing blue pool. Stylish wooden recliners and quirky tables surround the pool inviting you to rest, while the mirrored wall offers the illusion of spaciousness.